An interesting way for Bangalore traffic police to convey message to public. Yezdi bikers drive to Big Banyan tree on Mysore road. And didn’t even see the tree. 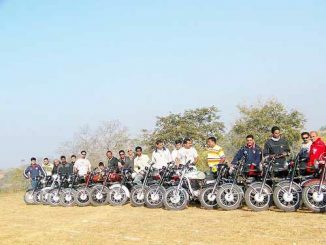 It was a heady mix of petrol fumes, burning rubber, shining chrome and unbridled energy as over 200 bikers recently got together to celebrate the International Yezdi-Jawa Day.